In preparation for painting a Zulu Wars British Force, I tested the 21 red acrylic paints I own for brightness and opacity. Obviously this test is not comprehensive. I’ll probably add to it if I get more paints. 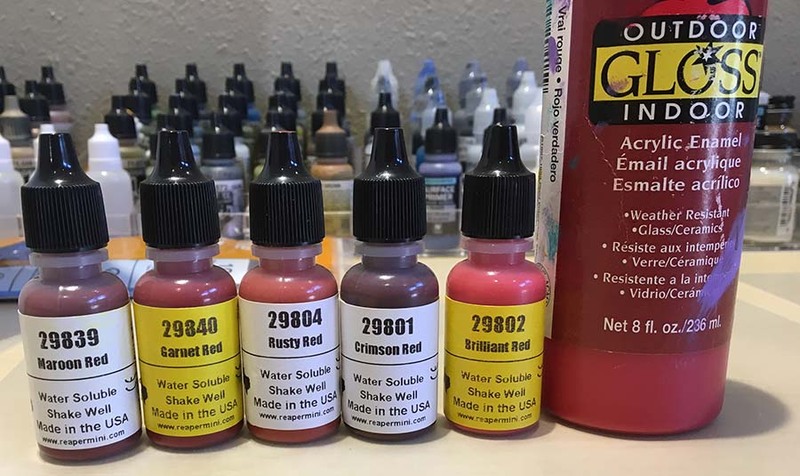 The five best reds in my test are (in order, from bright red to dark red): Liquitex Cadmium Red Medium (or Liquitex Cadmium Red Medium Hue), Vallejo Model Color 947 Red, Vallejo Model Color 957 Flat Red, and Vallejo Game Color Extra Opaque Heavy Red. These 5 colors would give you a very solid range of light to dark reds; I doubt you’d need any more. I painted a double layer and single layer of each paint on a sheet of white 24 lb paper. The paper had solid black areas and black lines to test the paint’s opacity over a black basecoat. I used a Rosemary & Co. flat brush. I also used an airbrush to apply the Vallejo Model Air paints and the Vallejo Surface Pure Red primer. There was no opacity or brightness difference between brushed and airbrushed Model Air and Surface colors, though of course the airbrush gave a much smoother coat. I had already slightly thinned my Citadel paints when I decanted them into dropper bottles. I thinned the Apple Barrel Pure Red, Liquitex Cadmium Red Medium and the Liquitex Cadmium Red Medium Hue to a consistency comparable to the Vallejo paints. The remaining paints were used “out of the bottle” and not thinned. The number is brightness on a 1-10 scale, with 1 being the brightest. This is a somewhat subjective standard and includes lightness and vividness. A 1 is a very “good looking” red. Some paints may have a parenthetical letter that indicates if the color has a noticeable orange (o), purple (p) or brown (b) hue. A dark red isn’t necessarily a brown. Most of the reds don’t look particularly orange, blue or brown. If a paint is not otherwise described, it’s a “normal” red. Some ratings have a plus (+) or minus (-). This means that the rating is slightly higher or lower than most paints with that rating. Abbreviations: VMC means Vallejo Model Color. Due to issues with Vallejo changing paint names, I included the stock number. VGC means Vallejo Game Color. VGCX means Vallejo Game Color Extra Opaque. VMA means Vallejo Model Air. VSP means Vallejo Surface Primer. Liquitex means Liquitex Soft Body paint. I’ll use the full name in the paint list, but the abbreviations after that. Unsurprisingly, the brighter reds tended to have the worst opacity. Liquitex Soft Body Cadmium Red Medium was the best in this category, though Coat D’Arms Ruby Red is very slightly brighter. Cadmium Red Medium dries with a semi-gloss finish, but a drop of Liquitex Ultra Matte Medium will make it dead flat. Unfortunately, this paint is no longer being sold because cadmium is poisonous. Liquitex Cadmium Red Light C/A/2/A Very close to Coat D’Arms Angel Red, but superior. It rates C/A/2/A and is an excellent red. It’s as good as Liquitex Cadmium Red Medium, though a bit brighter. I don’t have the Cadmium Red Light Hue paint. Liquitex Cadmium Red Medium Hue has no cadmium and is slightly less opaque than Cadmium Red Medium. It’s the best of the Bright Reds that you can buy. Coat D’Arms Ruby Red is bright and has good opacity. It would have been the winner of this category but for the Liquitex paints. Citadel Wild Rider Red is a good match to Coat D’Arms Angel Red, but has superior opacity. It’s bright and warm. Coat D’Arms Angel Red is bright, warm and has poor opacity. I found it too thin out of the bottle and consider it barely acceptable. I’d use Citadel Wild Rider instead. VMA Italian Red and VMA Scarlet Red were almost completely transparent. I wouldn’t use these paints for brush painting. They are very good when airbrushed. It might make a good, strong glaze. 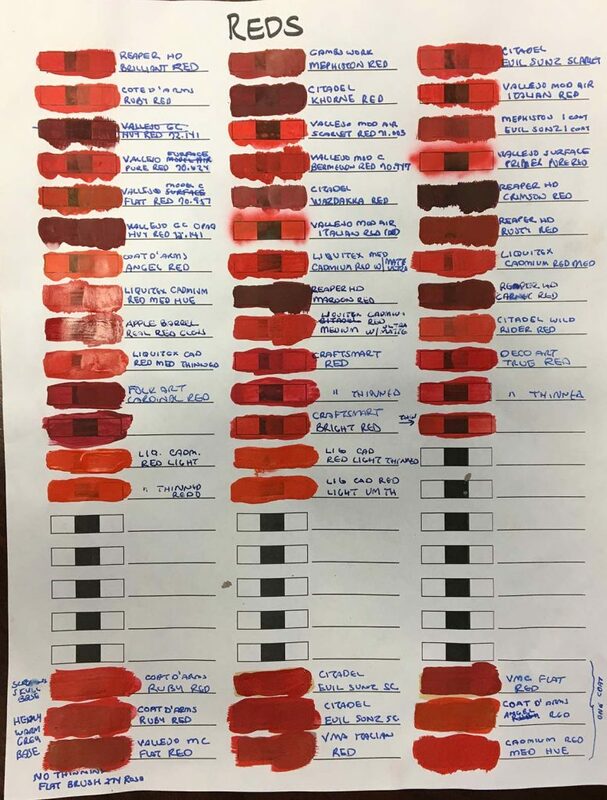 Note on Craft Paint Ratings. The ratings for the craft paints are when not thinned. When thinned, their opacity drops to D-/D- and coverage drops to B. Craft Smart Matte Red D/C/2/A- A cheap craft paint from Michaels with surprisingly good performance. Very close to Coat D’Arms Ruby Red, but better opacity when not thinned. When thinned, about the same. For 70 cents a 2 oz bottle, a steal. Craft Smart Matte Bright Red D/C/2/A- A cheap craft paint from Michaels with surprisingly good performance. Close to Coat D’Arms Angel Red, but better opacity when not thinned. Thinned, it’s about the same. For 70 cents a 2 oz bottle, a steal. Deco Art True Red D-/C/2/A- A craft paint that costs 2-3 times as much as the Craft Smart Red, yet is slightly inferior. I think that anyone who uses bright reds should try a bottle of Liquitex Soft Body Cadmium Red Medium (if you can find some) or Cadmium Red Medium Hue. I believe Liquitex paints cost about $6-8 for a 59 ml bottle compared with $3-4 for 18ml Vallejo/Coat D’Arms paints, 14 ml Reaper paints and 12 ml Citadel paints. Oh, and don’t lick your brushes after using the Cadmium Red Medium; cadmium is toxic. Vallejo Model Color 947 Red was the best – brighter than the other colors (except Vallejo Surface Primer Red) and noticeably more opaque than the other paints in a single layer. Citadel Evil Sunz Scarlet is a decent paint, but has no advantages over VMC 947 Red. Reaper HD Brilliant Red was surprisingly transparent for a high density paint. It’s very close in opacity to Citadel Evil Sunz Scarlet, despite being an “HD” paint. (I even tested it a second time to be sure). It goes on very smooth on the first layer. Vallejo Surface Primer Pure Red had surprisingly poor opacity, given that it’s a primer. Vallejo Model Color 957 Flat Red was the best in this category, mainly because it’s brighter. Citadel Wazdakka Red was a little more opaque with a single layer than VMC Flat Red, but not as bright. When applied in two layers, the paints are very close, with the Vallejo paint slightly brighter and more opaque, oddly. It’s a solid runner up and a good paint. Apple Barrel Acrylic Enamel Real Red was about as bright as VMC Flat Red. Compared to the other paints, it had poorer opacity, dries glossy and takes a little longer than the other paints to dry. Before being thinned, it performed more or less comparably to the game paints. But when thinned to a useable level, it compares poorly. It’s definitely useable as a VMC Flat Red substitute, but you’ll work a little harder to get a smooth coat. VCGX Heavy Red was the surprise hit. Color-wise it’s almost a perfect match for Citadel Khorne Red, but was completely opaque in a single layer. But this paint requires a lot of shaking to mix it thoroughly. On the first test, it wasn’t mixed well and it would’ve rated C on opacity for single and double layers. Reaper HD Crimson Red was as opaque as the VGCX Heavy Red, but was darkest red in this group. 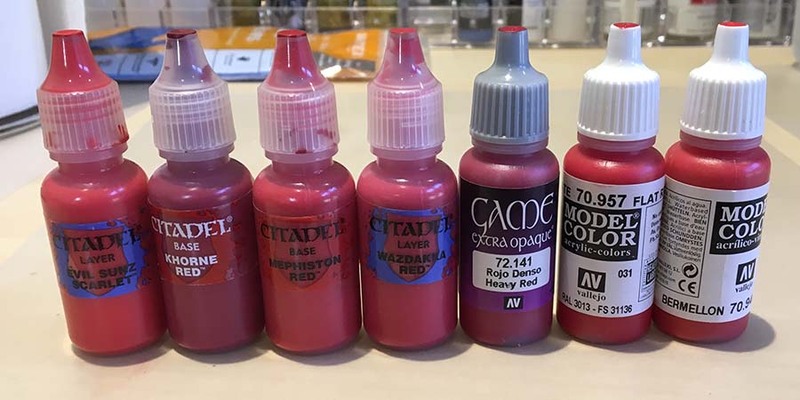 Reaper HD Garnet Red is similar to Khorne Red or VGCX Heavy Red. It has better opacity than Khorne Red But didn’t go on as smoothly. It has no advantage over VGCX Heavy Red. Citadel Mephiston Red is one of the brightest of the dark reds. I was a little surprised at its lower single layer opacity. My thinning could have affected the opacity, so I may re-test this with a fresh bottle in the future. Reaper HD Rusty Red is one of brightest of the dark reds, but it is noticeably more orange. Citadel Khorne Red is pretty much identical to VGCX Heavy Red, but not quite as opaque. Surprisingly, the second coat didn’t increase the opacity much. My thinning could have affected the opacity, so I may re-test this with a fresh bottle in the future. Folk Art Cardinal Red D/B/8/B – A craft paint close to VGCX Heavy Red, but grossly inferior opacity. A marginal substitute for VGCX Heavy Red – it will take 3 layers to get the opacity of 1 layer of VGCX Heavy Red. Reaper HD Maroon Red is similar to Khorne Red. It’s a little browner, but not as brown as Reaper HD Crimson Red. Opacity and coverage were excellent. I painted several of the reds over a VGCX Heavy Warmgrey basecoat. Compared with a white basecoat, all of the reds covered very well in a single coat, though they were slightly darker. I then painted them over a basecoat of Citadel Screaming Skull. The red paints covered significantly better than they did over a white basecoat, but not as well as they did over the VCCX Heavy Warmgrey base. They were also a little brighter. The implications are obvious – an off-white basecoat may significantly improve the opacity and coverage of the red paints. Takeaway – Based on this test, the clear winner among the craft paints is Michaels’ store brand Craft Smart Matte. At 70 cents a bottle, you pay about 1/12 the cost per ML as Vallejo. Or to put it another way, if you bought, say, 30 bottles of Vallejo Model Color, you’d pay about $100. If you bought 30 bottles of Craft Smart Matte paint, you’d spend $21 and you’d get 3.5 times the paint. Or, you could buy this set http://www.michaels.com/acrylic-paint-value-pack-by-craft-smart/10437751.html#q=Craft+Smart+Paint&start=2 and use a 50% off coupon. That would be 16 paints for $4 (!). Then buy 14 other colors for $10. That’s $14 for 30 paints. Even crazier cheap. You would, of course, spend more time painting. But for someone wanting to knock out miniatures for cheap, these paints are worth looking at. And if you strategically supplemented the craft paints with excellent game paints, you could put a very nice paint set together at a fraction of the cost of game paints. No one paint range is superior across the board. Vallejo is well-represented in the “winners” circle, but the Vallejo winners are from three different Vallejo ranges. All of the paints had good coverage (other than the craft paint) so none of them were unsuitable. I would not bother with brush painting Vallejo Model Air reds, though. They are great airbrush colors, but lack the opacity and coverage for brush painting. The Vallejo Surface Primer Red should be restricted to priming.